Today I received my official notice from the university that my promotion to associate professor with tenure has been approved. 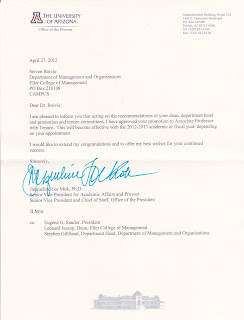 I will officially become an associate professor with the start of the new semester in the fall. This is very good news. The process is a long one, especially here at the University of Arizona. I submitted my tenure packet (a set of materials that makes the case why they should promote me) in August of last year. 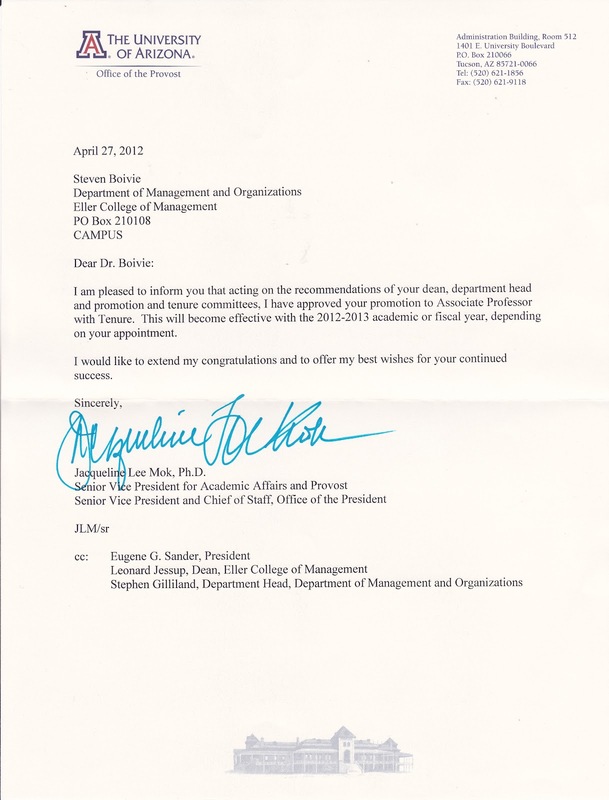 Second, getting tenure means that I am advancing in rank from assistant professor, to that of associate professor. There are only three real ranks an academic can achieve (assistant, associate, and full professor), so moving to the middle rank is significant. This also means that I will be expected to take on a broader role within my department and the academic community in terms of mentoring students, sitting on departmental and university committees, reviewing and editing research articles, and more. Third, it means that the university is committing to employ me until I retire. Essentially I have a job here as long as I want one. This kind of job security is unparallelled outside of an academic setting. The principle behind lifetime employment is that it gives academics freedom to do research and publish on unpopular topics without fear of reprisal from university officials. However, in practice it seems to exist mostly because of competitive pressure. Finally, the promotion is usually accompanied by a raise. Academic salaries do not usually go up much from year to year, so the promotion opportunities that occur with promotion to associate and full professor are usually the most significant raises you will ever see, unless you change jobs. Currently I do not know how much of a raise I will get, but any raise will obviously be nice. So, this is a big day for me and for my family. I feel very appreciate for all of the blessings that I have received. I have worked hard to get this promotion, but I am also very aware that most of my success comes because I have been blessed by the Lord. CONGRATULATIONS!!!!!! That is incredible! Did you let out a huge sigh of relief once you had that letter in your hand? congrats again, that is a long a tough road but you made it! Throughout the process I had gotten very positive feedback, so I wasn't that worried, but it was nice to have the official notice. You are awesome! We are so proud of you!! job security is HUGE! i wonder how much patrick's stress level would drop if he wasn't worrying about getting fired on a daily basis! congrats on the big milestone! Congrats! I had no doubt it would happen, but still a very exciting day nonetheless! We are glad to hear you are doing so well. Does that mean you are in Arizona for good or do professors move from one university to another looking for more opportunities? It means that if I wanted to stay in Arizona for good then they would have to let me. Professors do switch schools if they want to for various reasons.